The modern world has few occasions smarter than grand weddings, and for the majority of men the dress code will call for the most formal clothes they own. However, not all weddings are stiff affairs, and the location and style of the ceremony will dictate what kind of outfit the male guests should wear. Of course, at a social event, rather than a professional one, a man’s outfit should say something about his character, rather than about his job title. There is no better way to do this than by commissioning a bespoke suit, which, done right, speaks eloquently about the man who’s wearing it. This is the most formal outfit the majority of men will ever wear. Set aside any dark memories of the horror that is a trip to a hire shop, and instead remember the way that men looked in morning coats in the Thirties. Back then they were worn buttoned over the belly button and well-cut suits narrowed at the waist just like any other jacket. The Duke of Windsor’s marriage to Wallis Simpson may not have been widely celebrated but the coat in which he was married was a thing of wonder. 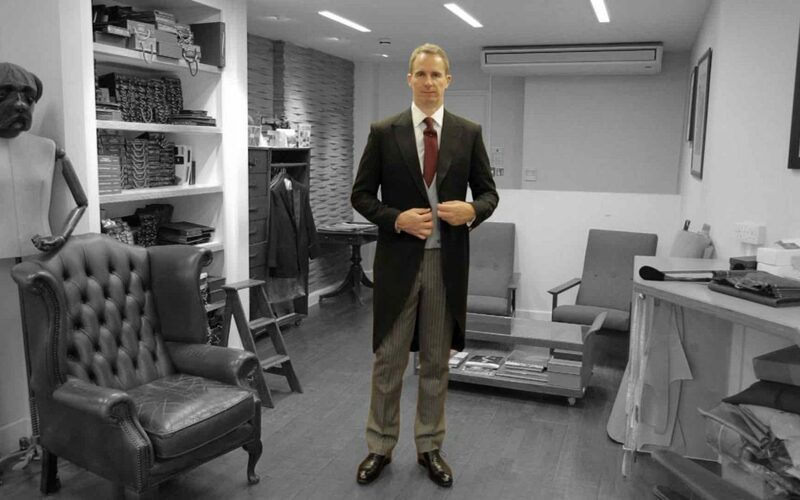 A morning coat’s tails are curved like a swallow’s tail, not cut-away like white tie, and the hem of the tails should hit your legs behind the knee. For weddings black is best, in a matte cloth with a subtle herringbone weave, and bound edges make a coat look distinguished, which is presumably why the present Prince of Wales likes them. The waistcoat can be wool or linen according to taste, or climate, and double-breasted looks smarter than single breasted. Either way popular colours include dove grey, pale yellow, and pale blue. The trousers are known both as sponge bag or cashmere trousers, although they bear no relation to either of these things, and are normally black with alternating wide and narrow grey stripes, although a paler puppy-tooth pattern is also appropriate and more distinctive. Under this wear a subtly-striped pale blue shirt, possibly with a white collar and cuffs, and a woven silk tie in a shade of silver, perhaps with a Prince of Wales check. Don’t forget a flower for your buttonhole, and to polish your black oxford shoes to within an inch of their life.